Income hunters have received a gift over the past few months as the market has swooned. Those looking for high yields now have an opportunity to jump into (or double down on) one of the best income-generating asset classes at suddenly bigger yields. We’re talking about master limited partnerships. MLPs have fallen hard for months amid the dual threat of rising interest rates and low/dropping oil and natural gas prices. The sector benchmark — the Alerian MLP Index — is down roughly 30% for the year-to-date and is sitting at its lowest level since 2013. However … these issues aren’t the dire threats to MLPs that most think. Most of these partnerships still rely on take-or-pay contracts, have very little commodity risk and act as toll takers that just collect fees based on volume. And as for rising interest rates … well, that actually doesn’t hurt MLPs as much as you’d think. In fact, most MLPs will be able to grow their distributions at faster speeds than the pace of interest rate increases. In the meantime, the big drop in MLPs has pushed yields up. So investors looking to cash in on some of the currently weak (but still attractive longer-term) names can do so while scoring much bigger income. When it comes to MLPs, boring is better. Firms that hold steady, predictable assets that produce cash flows are the ones to own. Sunoco Logistics Partners L.P. (SXL) fits into that camp. SXL’s bread ‘n’ butter is a vast network of refined products pipelines — think gasoline, jet fuel and heating oil. These assets are directly linked to various refineries and chemical facilities. As such, they are basically guaranteed to be used as gasoline and other products are shipped out from the refineries — often to Sunoco’s own terminals. While these boring pipelines provide cash flow, this MLP also offers growth potential. SXL has moved beyond just refined products. The firm has expanded into moving crude oil and natural gas liquids via pipelines in some of America’s strongest shale formations — places like the Eagle Ford and Marcellus, where they are still pumping and drilling. This extra oomph from rising crude oil volumes has helped SXL become a steady dividend grower for the past few years, including a 5% increase following record earnings for Q2 of this year. Some MLPs have had to deal with an additional issue on top of interest rate worries and low oil prices. Some MLPs have had to contend with whether they can be considered MLPs in the first place. Westlake Chemical Partners LP (WLKP) was the first of the so-called “cracker MLPs.” Basically, sponsor/general partner Westlake Chemical (WLK) was able to place a few of its ethane refineries into an MLP via an IRS private letter ruling. The unfortunate thing is that IRS backtracked on what constitutes qualifying income for an MLP. So WLKP couldn’t technically be an MLP anymore. As a result, shares of WLKP tanked. However, there’s still reason to like WLKP. For one, the IRS will allow Westlake Chemical Partners to function as an MLP for another 10 years. And the deal between WLK and WLKP implies that the MLP will sell a defined amount of cracked ethane back to its parent at a set rate. This is guaranteed earnings and cash — which in turn translates into distributions. Yes, WLKP wouldn’t have the goods to power your portfolio for decades, but a few years of thick dividends would be in the cards. That said, WLKP could still be a real long-term contender anyway. The IRS is rumored to be reconsidering the changes. 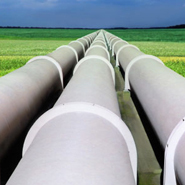 While pipeline firm TransCanada (TRP) continues to pop up in the headlines from time to time thanks to controversy, its MLP subsidiary TC Pipelines, LP (TCP) continues to hum along. That’s because it has nothing to do with the much-maligned Keystone XL pipeline. TCP does, however, own stakes in six of the largest and perhaps most important interstate natural gas pipelines in North America. These 5,560 miles’ worth of heavily FERC-regulated pipelines form the backbone of our main natural gas delivery system and moves about 8.9 billion cubic feet per day of natural gas. About 95% of TCP’s revenues come from capacity reservation/ship-or-pay contracts. Those pipelines, mega-volume of natural gas that flows through them and the style of contract are a cash cow for TCP and its investors. For the latest quarter, TCP saw a 20% jump in its cash flows versus the same quarter a year ago. That builds on the back of an impressive track record that has seen the MLP increase its dividend for 15 straight years. For many of us, the only time we think about propane is on the Fourth of July or similarly grilling-based holiday. The truth is, for some 48 million American households, propane is a vital energy source — and that number doesn’t even include industrial uses. For an overlooked fuel source, propane looks awfully good. MLP AmeriGas Partners, L.P. (APU) offers well more than 4%. Backing that high yield is the largest distributor of propane in the country. APU operating approximately 2,500 propane distribution locations and has more than 2 million retail and business customers. That huge size gives AmeriGas some unique advantages over its mom ‘n’ pop rivals. For starters, APU is able to pass along price increases quite easily to its customers. Switching costs for consumers are usually very high, and most propane distributors often have virtual monopolies in the towns they operate in. That means once an APU costumer, always an APU costumer. The result? Decent cash flows for APU, which means strong distributions. APU has grown its payout 37% in the past five years. When it comes to moving and processing natural gas, few MLPs are as large as Oneok Partners LP (OKS). Oneok’s entire asset based is devoted to natural gas. This includes a hefty amount of interstate transmission pipelines, as well as plenty of natural gas gathering lines and storage capacity — all throughout key production regions in the U.S. All in all, Oneok owns nearly 36,000 miles worth of natural gas and natural gas liquids pipelines. The problem for OKS has been its other main business line — natural gas liquids processing. While pipelines are a so-called “toll taking” business, NGL production/cracking isn’t. With natural gas prices dropping hard and lower NGL price differentials withstanding, results at OKS have languished and the MLP’s dividend coverage ratio has dropped. In fact, OKS has held its distribution at the same rate for four quarters now — a big no-no among MLPs. Meanwhile, investors have fled, driving Oneok Partners’ yield up above 9%. That yield might be safe, though. Natural gas has been ticking up in recent weeks, and OKS has moved to lessen its reliance on processing and return to primarily moving natural gas. That should bear fruit for the firm’s dividend. When it comes to MLPs, there are big yields … and then there are big yields. See: Alon USA Partners LP (ALDW), and its whopping 16%-plus yield. Refiner Alon USA Energy (ALJ) isn’t well-known, and that’s because it’s merely the seventh-largest outfit in the country, operating just three refineries. But one of those happens to be the crude oil refinery in Big Spring, Texas that can refine around 73,000 barrels of crude oil each day. While that doesn’t seem like that much — and it isn’t compared to what comes out from a giant like Valero (VLO) — it does make it easy for small changes to influence ALJ’s bottom line. VLO has to have all its facilities humming along to really move the needle. Crack spreads and margins continue to look juicy for refiners, which sounds even better when you can get the benefits in an MLP. Which brings us to ALDW’s huge yield. ALJ placed the Big Springs facility into ALDW and structured the MLP to pass through all its cash flows back to its shareholders (and ALJ is one) through dividends. Now, ALDW has cut its payout in the past. But it does have a good chance of keeping the distribution high as well as oil remains range-bound and margins remain attractive. If you’ve got some risk tolerance, ALDW’s yield might be too good to pass up! Article printed from InvestorPlace Media, https://investorplace.com/2015/11/high-yield-mlps-6-16-percent/.